In the quest for a healthier lifestyle we need to make time for breakfast, and that doesn’t mean a coffee and a donut at 10:00 am. The perfect breakfast is one that contains complex carbohydrates found in whole grains, some protein, a calcium source from milk or fortified soy beverage, and fruit. Everybody needs that morning fuel-up to kick-start their metabolism and their brain. Breakfast eaters think more clearly and tend to be in a better mood than non-breakfast eaters. The guy that cut you off in traffic this morning, probably didn’t make time for a morning nosh. People who skip le petit dejeuner have less energy, deal with stress less effectively, and can even have higher incidences of depression. If that doesn’t grab your attention – how about weighing less? In a study reported in the January 2008 issue of American Journal of Clinical Nutrition, researchers from Penn State put 50 obese adults on a reduced calorie diet for 12 weeks. Half the group was asked to eat whole grains; the other half was advised to avoid them. Both groups lost weight, but the whole grain group had a greater decrease in abdominal fat aka the evil belly fat. Want to get into smaller pants? Switch from refined grains to whole grains as part of your weight loss plan. Whole grains in the morning usually mean cereal. But which whole grain cereal do you choose? The cereal aisle is a potpourri of boxes with nutrition labels touting whole grains, lower sugar and high fibre. I’ve tried most of them. Some are good, others not so much. My personal favourites are whole grain flakes or muesli. Muesli is a Swiss breakfast cereal made with raw or toasted whole grain flakes, seeds, nuts, and dried fruit. Many years ago I came across a brand from the UK – Dorset and it became my house favourite. With no preservatives, extremely low in sodium, and a great source of fibre, this muesli gets top marks for health as well as taste. Every variety contains a mixture of nuts and seeds for that all important morning protein hit. In the whole grain flake department I am a fan of Nature’s Path cereals. They tend to be low in the sugar department and high in the flavour department. Add a source of protein – nuts are always my morning choice to up the nutrition ante. I am a huge fan of Kellogg’s All-Bran Buds this high fibre cereal has 11 g of fibre per serving, most of it soluble which is the cholesterol lowering type. Oatmeal is always a great choice, but once again make sure to add some nuts or nut butter for that hit of protein that your body needs. I love all types of oatmeal but I am a big fan of Steel Cut Oats or Irish Oats. 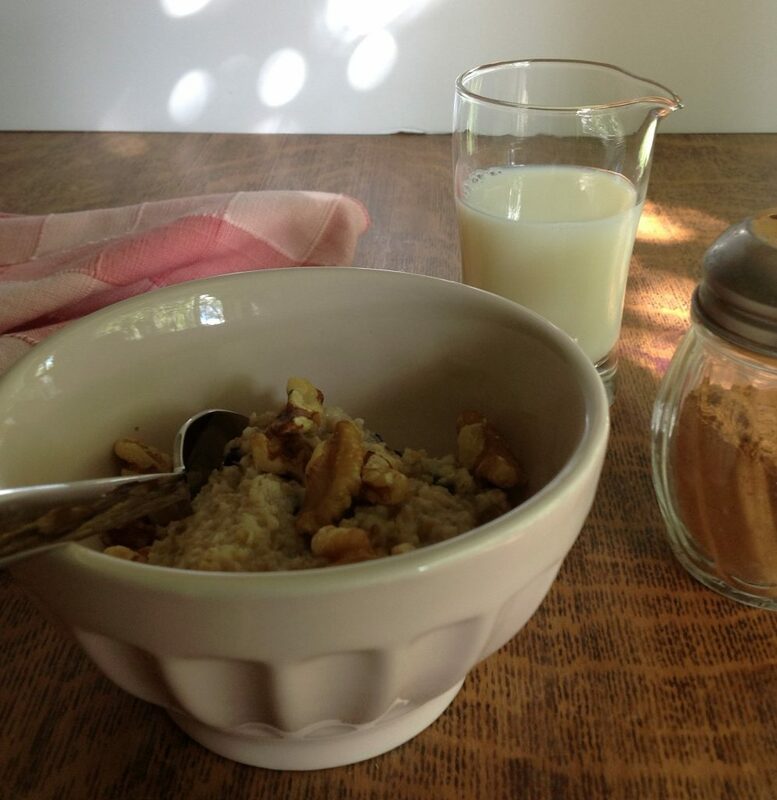 All types of oatmeal can help lower your cholesterol. See below for my recipe for Overnight Oats. Quaker is the King of Oats and Oat Products in Canada and they now have Steel Cut oats in their oat line up. If you aren’t a cereal lover then 100% whole grain bread or crackers with a nut butter like peanut or cashew, plus a glass of milk or fortified organic soy beverage is a great choice. Add some fruit to any of the above breakfast suggestions and you’ll be well on your way to having a great day in the nutrition department. Is there a way to do this in a crock pot? The reason I came up with this method is because I didn’t like any of the crock pot methods I came across, I felt that they made the oats really gummy. I have made oatmeal this way & it works well. It is so much faster to finish in the morning after pre-cooking this way. Had the same “gummy” problem with the crock pot/slow cooker version. Thanks for weighing in! I really love this method.